With strawberries coming into season within the next month or so I thought it was about time to put on my thinking cap and start developing recipes to take advantage of their deliciousness. I can happily say that I think you’re going to like what I came up with. 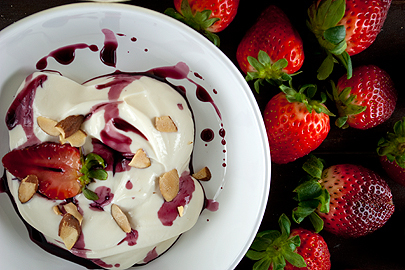 Whether for a luxurious breakfast or an interesting and light Spring dessert, the combination of Greek yogurt, fresh strawberries, lightly toasted almond slices and a Beaujolais wine reduction is sure to be a hit. Though it’s a ridiculously simple dish to put together, the flavors are surprisingly complex. The predominant flavor profile is earthy, thanks in part to the interplay between the yogurt, slightly sweetened with local Alabama honey, and the light nuttiness of the toasted almond slices. 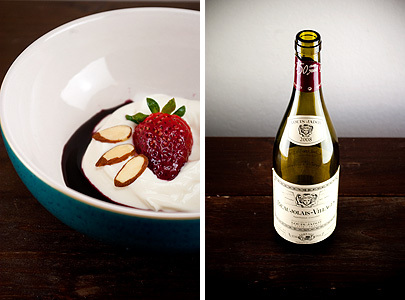 The dry fruitiness of the slightly peppery Beaujolais reduction also mingles particularly well with the acidic, pungent earthy flavors of the strawberries, which are macerated in a bit of aged balsamic vinegar and sugar to intensify their flavor. But perhaps my favorite part of the dish lies in the delicate contrast of textures; the sensations of the rich and creamy yogurt against the slight crunch of the almonds is particularly superb. Spread almonds evenly over a baking sheet and toast for 8-10 minutes, stirring halfway through, and allow to cool. In a small bowl, combine yogurt and honey and refrigerate. Slice strawberries in half. In a small bowl, combine with vinegar and a teaspoon of sugar. Let the mixture macerate for 20-30 minutes at room temperature, stirring occasionally. In a small sauce pot, combine wine, 1/4 cup sugar, and black pepper. Reduce mixture over medium-high heat until the mixture coats the back of a spoon (should reduce to around 1/3 cup). Allow the mixture to cool (you can speed up the process by placing the pot directly into an ice bath and stirring until cool). To assemble, dollop yogurt in the center of a small bowl, spoon wine around the edges, and arrange strawberries and nuts in an attractive pattern. Serve chilled. I got hooked on yogurt about 2 years ago in a very nice cafe dedicated to fresh and frozen yogurts (Fraiche, Palo Alto), and since than I keep having yogurt with fresh and dried fruits and nuts for breakfast pretty much regularly. It’s so refreshing, tasty, addictive, and yet healthy . Love your idea of adding wine reduction! Will try it next time. By the way, I am sometimes having cottage cheese instead of yogurt, that’s quite good too. Funny you say that, we have two main breakfast obsessions — Greek yogurt and fresh ricotta/cottage cheese. Both are so delicious — and both would work equally well with this dish. I found your blog today and I tried out the “Greek Yogurt…” tonight. O man, this is very tasty and I’ve never had Greek Yogurt before. Not too sweet and yes, healthy too! Keep posting!